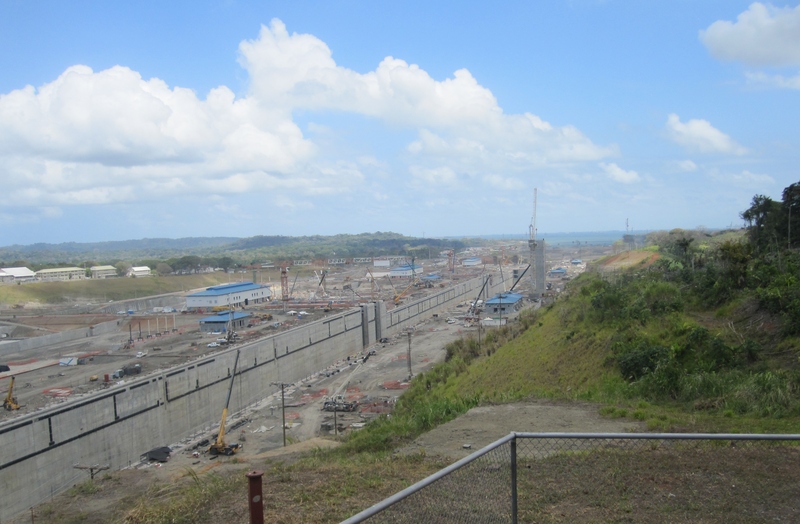 I had heard rumors that the Panama Canal is being expanded but the report never went beyond that. When our cruise line offered a shore excursion about the Expansion of the Canal I just had to sign up to see for myself. Yes, the canal is being expanded. The inauguration is scheduled for this summer, but they are not saying when the new locks will actually be put into use. The mechanisms will have to meet specified performance criteria, all the moving parts doing their job in the allotted number of minutes. But it is clear that they are well on the way to completion. 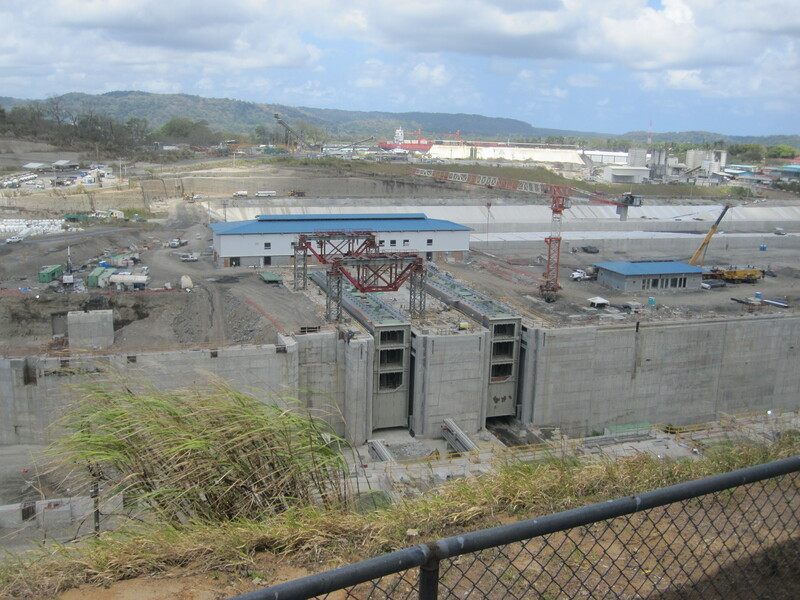 One factor which has held back expansion plans for decades is whether Gatun Lake could provide enough water to flow downhill and out through more chambers. 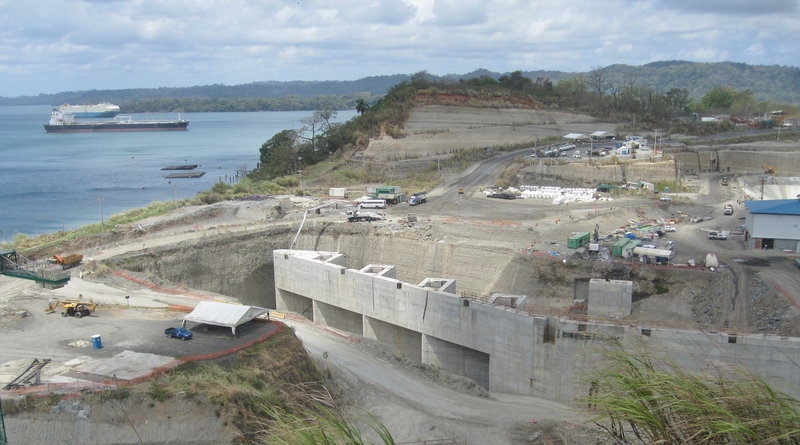 The current construction plan raises the level of Gatun Lake so there is more water available. Also the new locks will be re-using sixty percent of the water for each cycle, shunting water off to basins beside each chamber between cycles. They are also making room for bigger ships by deepening and widening the navigational channels of the Lake and the Culebra Cut through the Continental Divide. But I said something about “massive” at the start. Even seen from the nearby hilltop visitor center, the Atlantic lock channel looks HUGE. And the lock gates are ENORMOUS. The new gates will slide out perpendicular to the channel rather than swing on hinges to meet at the center. The bottom chamber will be filled with water “to keep them from floating.” (To which I’m thinking, “As if!”) If you click here and scroll down you will see many excellent pictures of the gates in transit, partially through the old locks, to their final position. Can you imagine having one of those topple off the container ship you are commanding? This is just one massive project, people! I encourage you to read through sections of the website above and this one as well. The engineers estimate that the work is 87.5% complete. There are proponents and opponents of the project but it would be unreasonable to expect that all agree. We should see ships passing through the larger locks in 2016 IF everything proceeds as expected. Stay tuned. I will be happy to book you on a Post-Panamax crossing – or even a “classic” crossing if you prefer smaller ships (as I do). This entry was posted in Travel, Uncategorized and tagged cruise, expansion, Gatun Lake, massive, Panama Canal, Panamax, travel. Bookmark the permalink.